A: Desperate to get your marketing act together to save your business. B: Aware that you should probably be super-charging your marketing but not sure how to go about it. If you’re at A, don’t fret; you’ve come to the right place at the right time. There’s tons you can do to bring in new customers. If you’re person B, you should really borrow a little from person A’s book! Seriously, if you treat your marketing strategy like you’re tackling a crisis, you will be able to generate thousands in extra revenue and quickly win a loyal customer base. Above all else, the most important thing you can do is get new clients sitting in your salon chair. Do whatever it takes to achieve this, even if it means giving away free sessions (although this is not at all necessary). Customer loyalty is won or lost during your client’s first session with your salon. More on this later. How do people discover businesses like mine and how am I going to make sure my marketing content reaches those spaces? Bear this question in mind as we go through the following guide. Where better to start than Google? Because it is such a well used brand discovery platform (with over 3.5 billion searches per day) and because Google is so hot on geo-targeting, it is essential that your salon ranks on the first page of local search results. This can either be done through paid advertising or via search engine optimization (SEO). You’ll notice that most of the Google search page is dominated by the Treatwell salon booking platform. They have pretty strong Google search dominance at time of writing, so it might be worth making a free application to list your salon. The upside is your business will be displayed prominently in local searches and the site offers a handy appointment booking service. The downside is that they take a 20% + VAT commission fee on bookings, and there are other charges such as signup fees, but it will mean you get your salon out there. Read the terms and conditions before making your decision. If posting a profile on a listing service like Treatwell, Timeout or Gumtree, it’s worth bearing in mind the best way to do this. Notice how the top Treatwell listing (Brasil Hair) is a “featured” listing? This means the salon has paid to give it priority. A lot of these directories, just like Google itself, privilege those who pay to get their content boosted. You only have a few words (here, under 40) to display in the description, so make each word count. Brasil Hair do a good job of conveying the value of their salon; key words such as “high-end hairdressing”, “indulgent beauty services” and “dedicated stylist” capture the reader’s interest. The fact that you can “unwind with a refreshing cup of tea” shows that this is a salon that cares about its clientele and is going to offer you an experience, not just a service. The accompanying thumbnail image is another opportunity to put your salon across in the best light. Make sure you have a range of high-res promo photos to hand when creating online listings. The next thing that appeared on our Google search page was a Google Maps listing of hair salons in the local area. To appear in these results you need to have registered your salon on Google Business, it’s free, quick, and easy, and you should absolutely do so now. 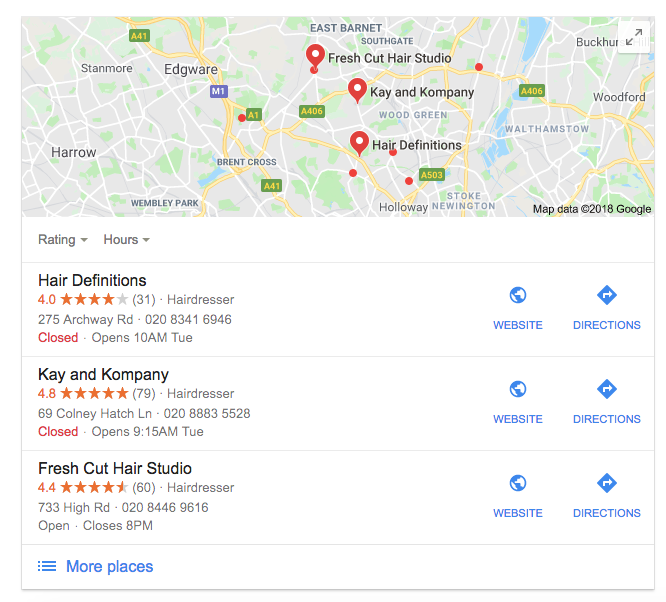 Your Google Business listing gives users an all-round impression of your salon, so it’s important that you take a 360° approach to your marketing. 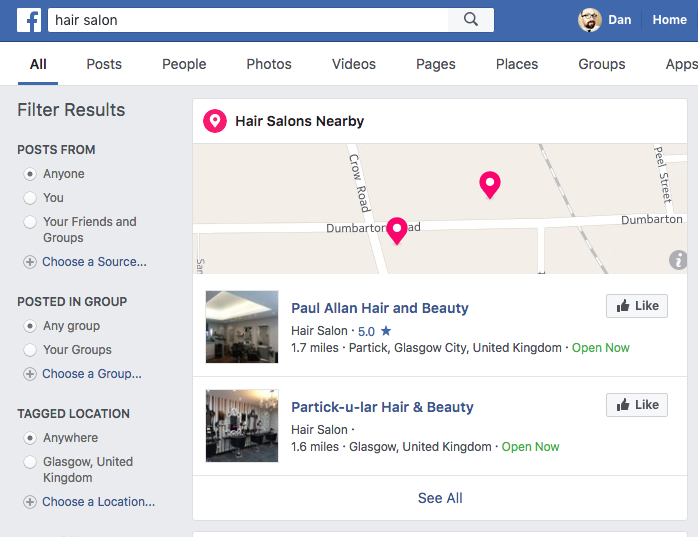 The business listing provides users with a map thumbnail of your location, an outside view of your salon, and links to any photos you have uploaded to your business page. Address, opening hours, and contact details all need to be up to date and plugged in… and photos need to be uploaded. If we click onto the photos on the Hair Definitions listing, we can see they have included in-salon shots showing off client’s hairstyles. These sorts of “action” photos are absolutely crucial for marketing your salon; it’s nerve-wracking going to a new salon. Potential customers are looking for every available sign that your salon will deliver a service that will give them what they want and leave them feeling confident and looking great. It’s best to avoid taking these photos yourself; hire a professional to take top quality photos. The last thing you want is badly chosen, poorly lit and wonkily framed photos, because this will detract from your marketing power. 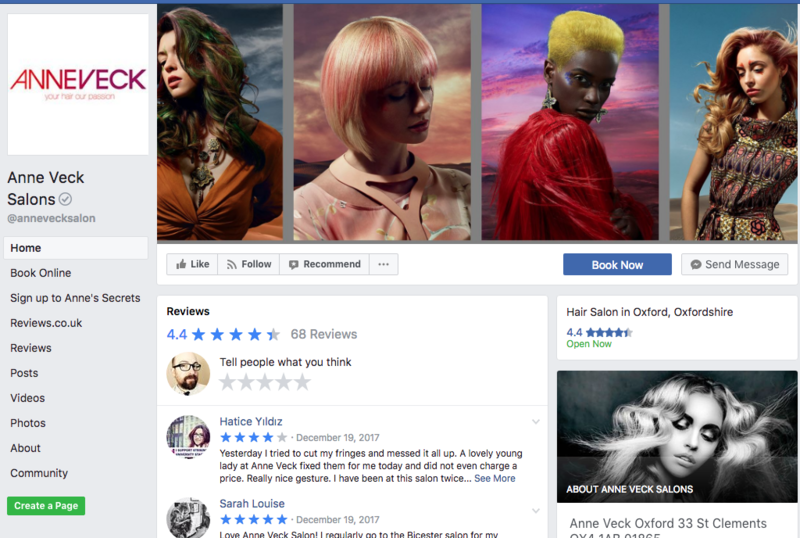 They’re packed with brightly lit hairstyle action shots, and they take every opportunity to signal value by including images of reviews and awards the brand has garnered. Given that your website is the key thing being linked to via search engines, it’s essential that it becomes the centre-piece of your marketing strategy. 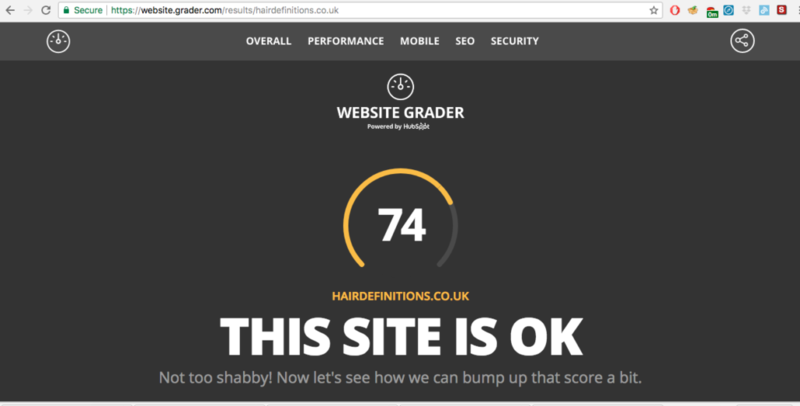 Use a free tool like Website Grader to make sure your site is firing on all cylinders. The page performance is slow, but their page loads quickly and, crucially, it is fully SEO’d. Just post your URL in the search field at the top of the page to find out how to improve your site. Page titles: no more than 70 characters long with no repeated keywords. Meta description: up to 160 characters, this is the short description that appears under the page title in search results. Every searchable page on your site needs its own unique meta description. It’s your showcase to readers and will help them decide if your site provides the services they need. Make sure you get it right. Notice how it gets straight to the point and lists the brand’s keywords in a natural way? Your salon’s meta-description should emulate this. Headings: the content on your site needs to be broken down into easy to follow headings (marked with the appropriate H-tag) that help the reader’s eye skim over the page to find the content they want. Notice how the page headings are also the salon’s key search terms? You should do the same, because search engines like Google look at these H-tagged headings to help understand what kind of content your site contains. XML Sitemap: this is something your website design team can handle; it is basically a plan of your site written in code form that you submit to Google to help them properly index your page. Your XML site map should only include pages you want people to be able to search for. 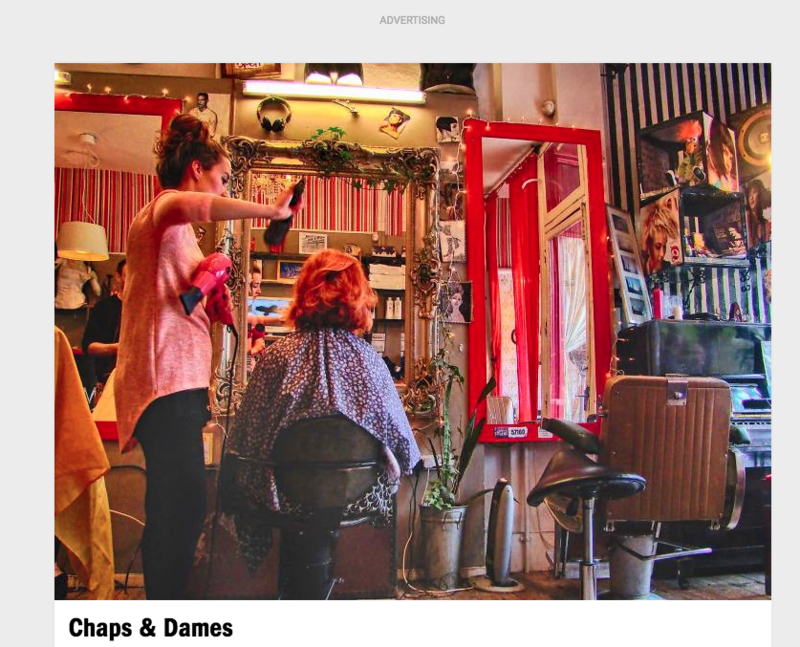 The salons featured in this TimeOut article have been selected by in-house testers, but notice that there are paid for ad slots on the page. TimeOut reaches millions of users every month, so it’s worth investing in advertising on their site. 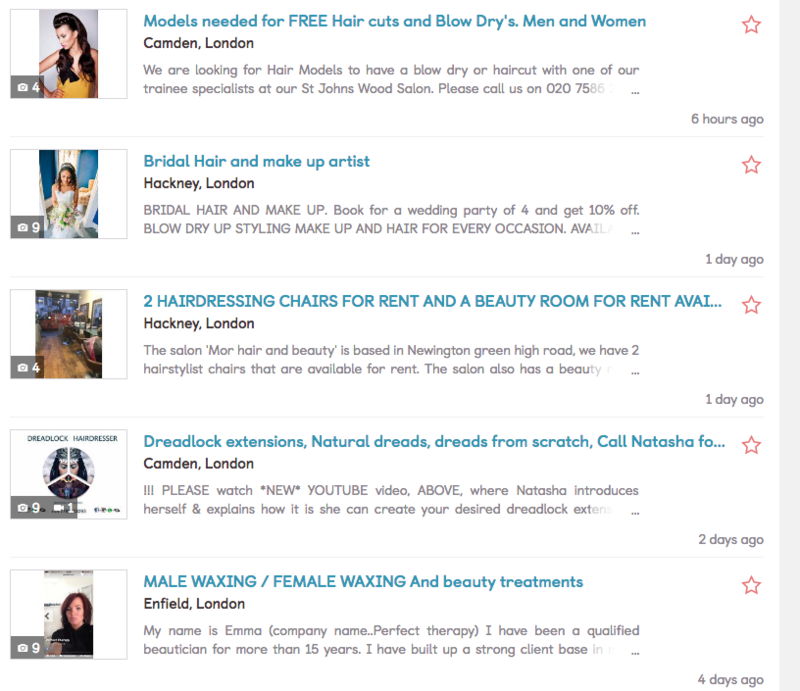 If we then jump on the Gumtree page that came up from our “hair salon North London” search, we’ll notice a range of hair salon ads, from model hiring, to free trainee haircuts, to chairs for hire. 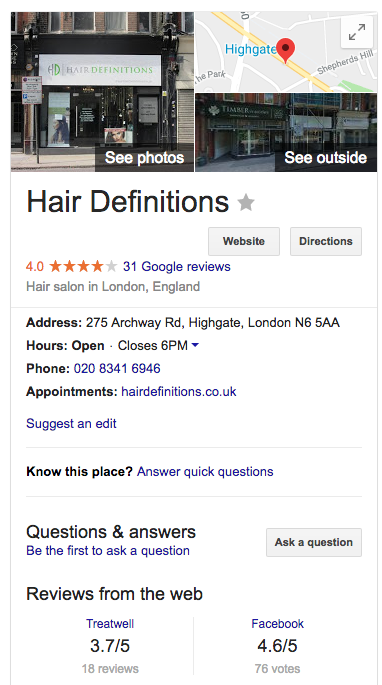 Notice how Google has pulled up a Gumtree results page with the tag “hairdressing”. 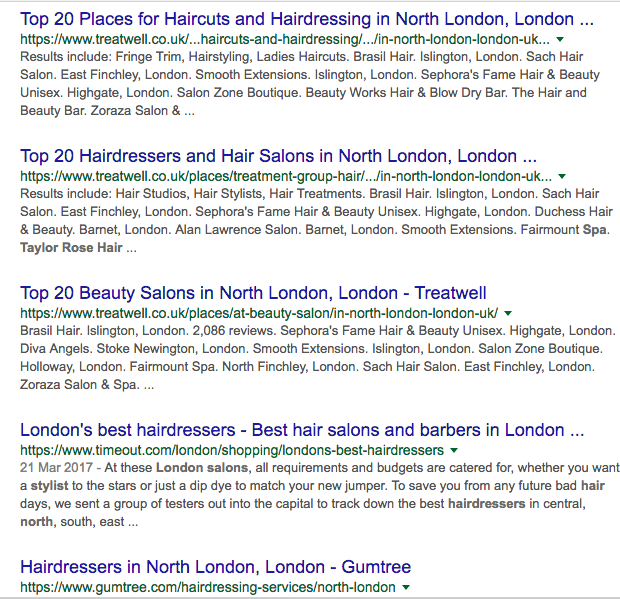 If “hair salon North London” was one of your SEO key phrases, you’d want to make sure you posted a Gumtree ad in the “hairdressing” section. Also notice the list of “top searches” beneath the search field. If any of your services match these keywords, make sure your Gumtree ad includes the relevant term, for example “afro hairdresser”, or, “free haircut”. 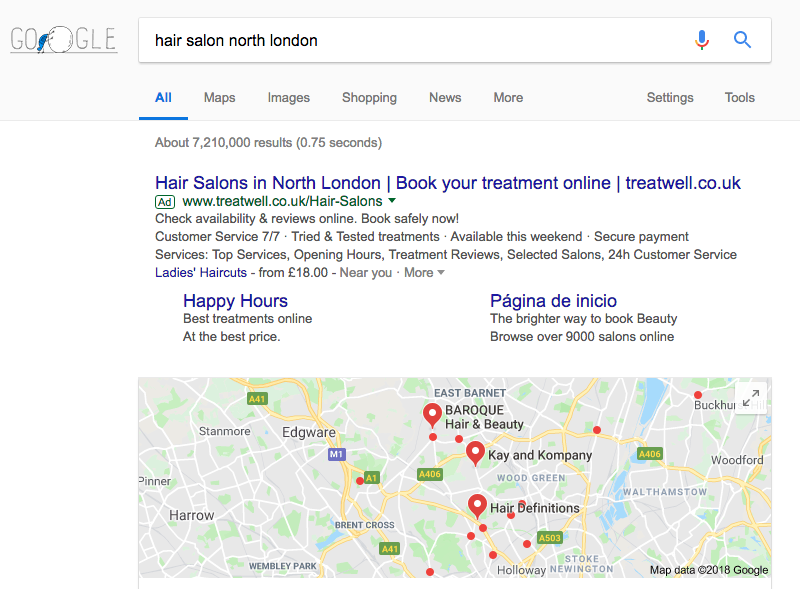 To work out exactly what tags and search terms to list your salon under, try and find your own salon via Google/Gumtree etc; you’ll get a great first-hand experience of the kinds of search terms your clients might be using. Once you know what search terms and tags to use, you can set about optimising your content to hit those tags. You can pay Google to display your site when certain search terms are used. You only pay when your ad is clicked on, so this can be a great way to invest in marketing on a results-first basis. Before creating a PPC ad, make sure you know what key words will work for you. You need to get a balance between terms that are unique to your salon and terms that users are actually going to be searching for. You may be the longest established salon in your area, but are people actually going to be searching for that? Hair salons near them: i.e., “hair salon N1”, “hair salon Camden”. Affordable salons, i.e. 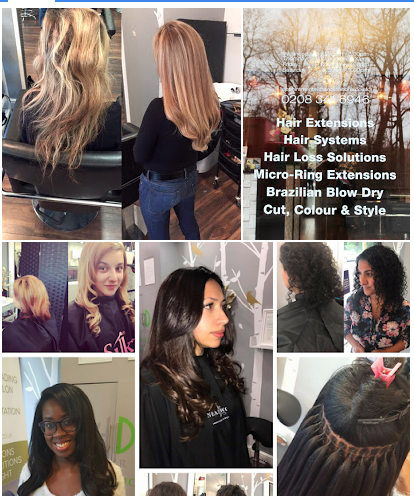 : “cheap hair salon”, “hair salon discount”, “budget hairdresser North London”. Speaking of “affordable”, this brings us to the topic of upselling and its associated topic of what we’ll call “price tiers”. The Budget Shopper is motivated primarily by how cheap your services are. The Style Guru is motivated to find the best quality hair cut out there. Unless they are a very high earner, they will also be motivated by cost, but that just won’t be such a priority. By extension (pardon the pun), the Budget Shopper is also motivated by quality of service, it’s just that they will stick very closely to a pre-set budget. So don’t start thinking that the Budget Shopper will stand for a lousy service; the cheapness of your cuts may get them through the door, but unless they also get a great cut and great services, they’ll be visiting another salon in three months’ time. You want to attract both tiers of customer, both Budget Shopper and Style Guru, to your salon. The trick is to make sure those who can afford to spend more don’t take advantage of the cheap deals you’re offering budget shoppers! There are various ways you can do this. Toni and Guy have a book of hair cuts from which their clients must select a cut. Perhaps your salon has a “book” of affordable cuts; fancy cuts are aimed at the Style Gurus, and popular yet easier cuts are aimed at the Budget Shoppers. Or perhaps styles that are only 6 months old cost more than cuts that have been around for a few years. The trick is to find a balancing act so that both tiers of client are completely satisfied with your service. It’s also worth noting that people don’t stay in these tiers their whole life. If Budget Shopper gets a pay rise, you don’t want her to start frequenting your upmarket rivals; you want her to feel confident splashing out more money in your salon. But to do this you need to win customer loyalty. Here’s the amazing thing: customer loyalty is incredibly powerful. Clients hate changing salon’s; there’s no way to know for sure what quality of service you are going to get until you walk out of the salon with either head held high or rushing to the nearest hat shop. So if you win your client’s loyalty, they’ll be a client for life (or at least until they move away from the area!). And it’s through the quality of your service that loyalty is won. Marketing doesn’t end once your client walks in the door of your salon. In fact, that’s where effective marketing really begins. A client may have been attracted by a special offer, or have received a recommendation from a friend. But if they don’t come out feeling confident and attractive, they very likely won’t return to your salon… and they certainly won’t recommend your services to their friends and family. Your stylists should be active “brand ambassadors” for your salon; encourage them to try out your product range so that they can advise clients. A friend of mine went to a hairdresser one Christmas, and noticed her stylist was wearing sparkly hair extensions. 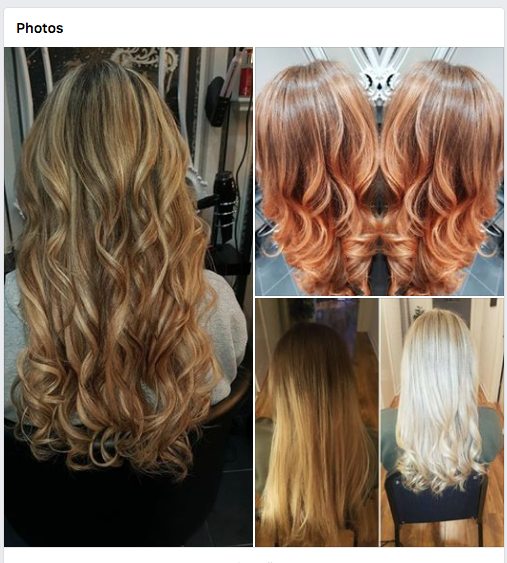 When she asked “where did you get those?” the stylist was able to reply “we sell them here, actually… they’re only £1 each!” Not only was that great upselling, the happy client told everyone she’d met about where she got her cool sparkly hair from! Her cover image shows off a range of stylish haircut action shots. 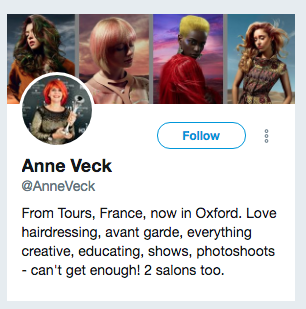 Her username is the same as her brand name: Anne Veck. Notice that it’s not unprofessional looking, like @anneveck23 or, unguessable like @_anne-veck. Make sure your username matches your brand name as closely as possible and looks professional. Apply this to all your social media accounts. When perfecting your Twitter presence, as with all social media, make sure you find the best accounts out there and study what they do; then try and apply it to your own social media presence. Remember that different salons have different personalities; don’t try and apply a style that doesn’t fit. 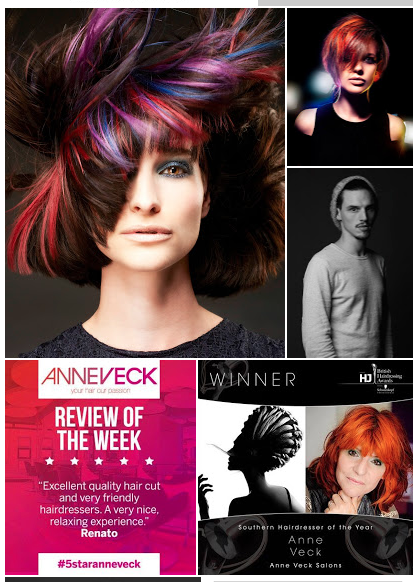 For example, Anne Veck’s blurb shows her to be fun, exciting, “avant-garde”. Some clients want to fit in and others want to stand out. Veck is clearly going for the latter. 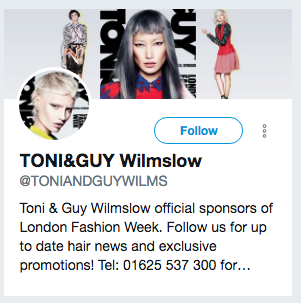 They flag up the brand’s authority (sponsoring London Fashion Week) and emphasise the benefits of following their account: “hair news and exclusive promotions”. Ask yourself, “what value will people get from following my account? Informational value? I.e., “up to date hair news”. Material value? I.e., “exclusive promotions”. Note the inclusion of a phone number. You need to make it as easy as possible to turn social followers into paying clients. 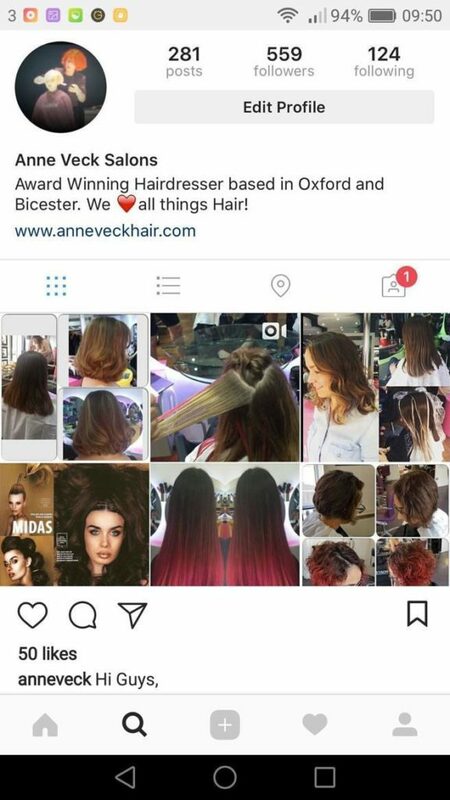 Instagram is a visual medium; and guess what, so is hairdressing. You need to get on Instagram to market your salon. 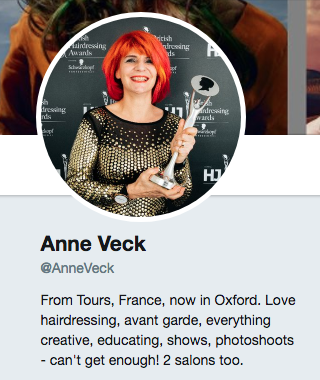 Again, jumping onto Veck’s account we see a snappy and concise bio followed by a series of pics that show her in action, and show off the fruits of her labour. Create your own hashtag so you and your clientele can share and discover images. Create brand ambassadors: these are social media influencers who have a broader following than you. Offer them free or discounted services from your salon in return for posting enthusiastically to their followers. Give them a discount code or hashtag to share so you can monitor how effective the promotion is being. 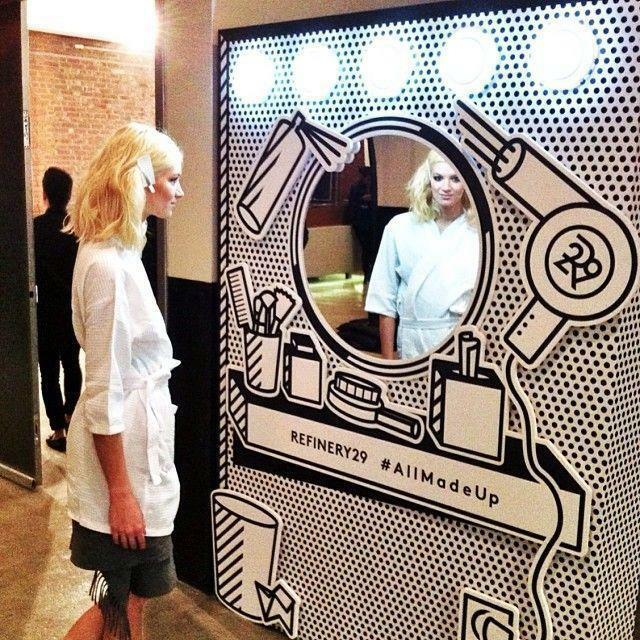 Set up a selfie station at your salon: encourage clients to show off their cuts and post to Instagram and social media with your hashtag. Display your tag on the station to make it as easy as possible for users to share their snaps. Facebook is just one of those staple social media platforms that are essential for all marketing needs. You need to get on it. Searches are geo-located too, so it increases the likelihood that your fans and followers will live in the local area and might easily be turned into customers. 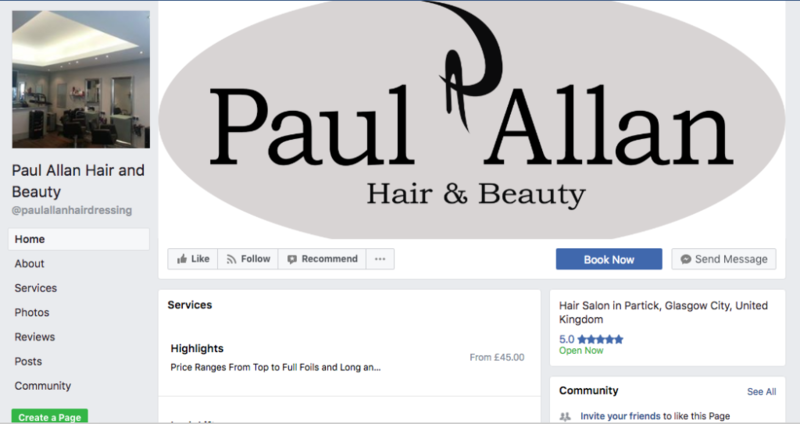 If we look at this salon page we can see that their brand name and logo dominates, but notice there are no indications of the quality of service. They’re missing a trick here! 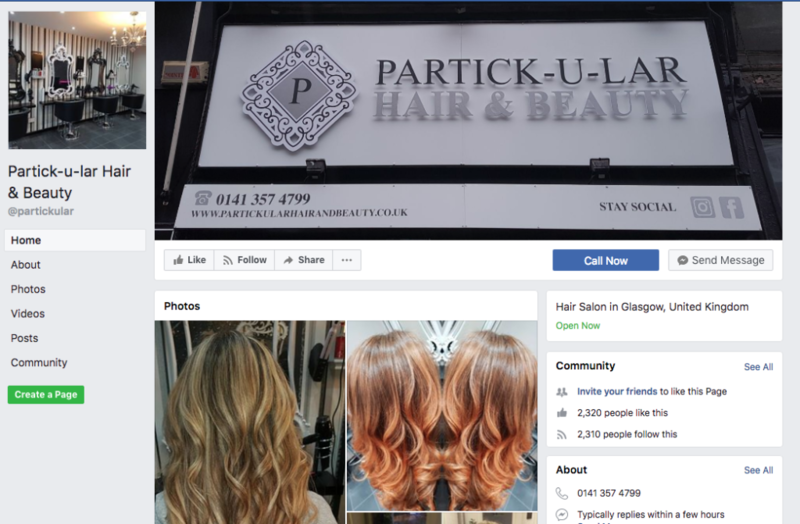 The profile pic is much clearer than in our previous example, we get a look at the outside of the shop, and we get some hair shots too, though they’re a little samey and don’t fully show off the range of services available. By contrast, if we once more jump back on Anne Veck’s case, we can see her Facebook presence is that of a complete pro. All in one glance we get her profesh logo, a cover image which shows off a wide range of stylish hair action shots, and scores of positive reviews. We even get an additional hair shot in the About section on the bottom right of the screen. You need to make the most of each opportunity to display text and imagery on your social media profile. Each image slot on the page should show off a different aspect of what you do. This will instil confidence in potential customers. Running competitions is a great way to simultaneously create engagement with followers, build your fan base AND attract new customers. 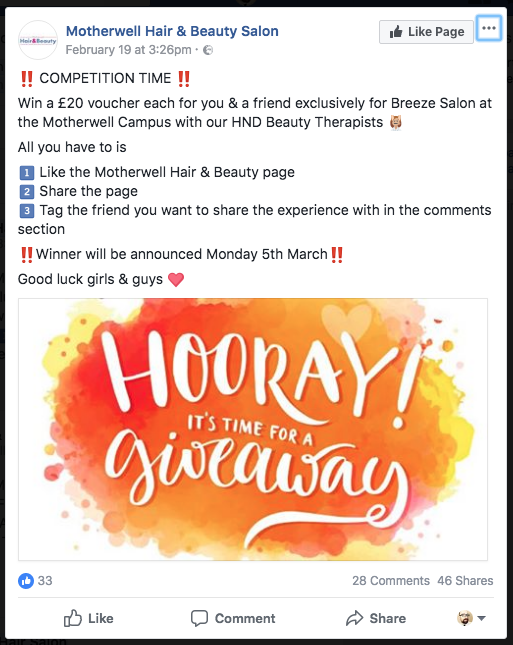 You can use a free competition app like Rafflecopter or Gleam, or monitor the competition manually; however you do it, ideally you want a prize that will bring people in through the door of your salon. 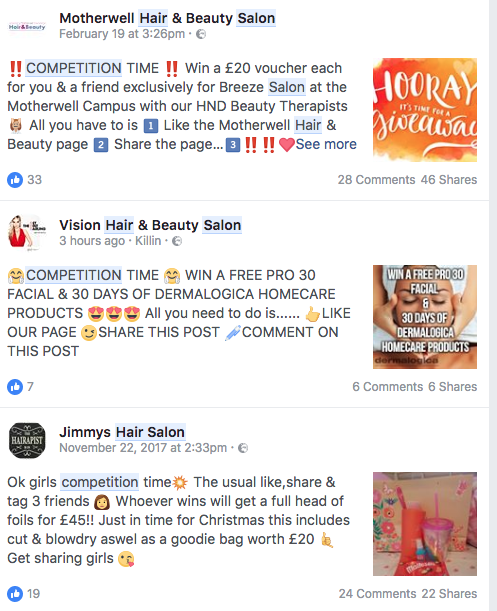 The above example is a fairly solid idea; “£20 vouchers for you and a friend”; that encourages people to not only engage with your page, but also reach out to their friends and spread the word about your services. Share the page: spreads your services into people’s newsfeeds without having to pay to do so. It also helps that your content is being shared by a human and not by an ad server. Mobile is absolutely huge for your business. Around 80% of social media time is spent on mobile devices. Nearly 60% of users won’t share a site with a badly designed mobile site. 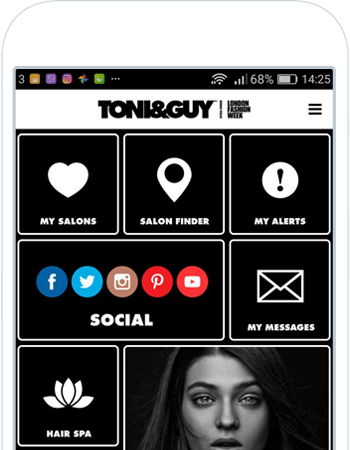 If we pull up a Toni and Guy salon URL on a smartphone we can see that it is fully optimised for mobile. Make sure your mobile site is optimised for speed and responsiveness. Over 50% of people will abandon a site if it doesn’t load within 3 seconds. Google will also use page speed as a ranking factor for mobile search from July 2018. Test My Site with Google offers various apps to measure load speed and user experience. Do an audit of your mobile site speed and make any necessary adjustments… or risk penalisation by search engines. To make your site fit with mobile you’ll want to utilise some of the benefits of mobile apps. A great half-way house between website and app is to use what is known as a Progressive Web App (PWA). They don’t need to be downloaded from an app store, they run across all devices, and are accessible via laptop and desktop; plus they utilise a lot of the mobile tech that makes mobile apps such powerful tools (more on that below!). 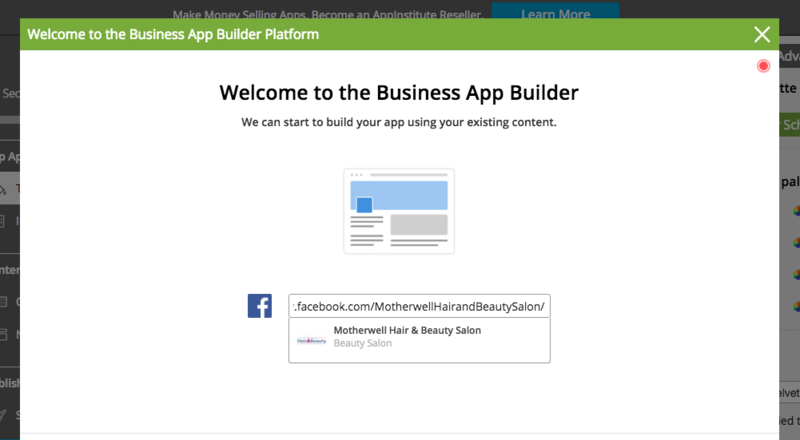 You can either hire a pro to build your hair salon app, or use our DIY app maker which is super easy to use. It pulls data like colour scheme and images from your Facebook page and coordinates it with your URL content to create a cohesive, branded app which you can easily edit using drag and drop functionality. And if you get stuck or want to take your app to the next level you can easily hire us to develop your app for you. 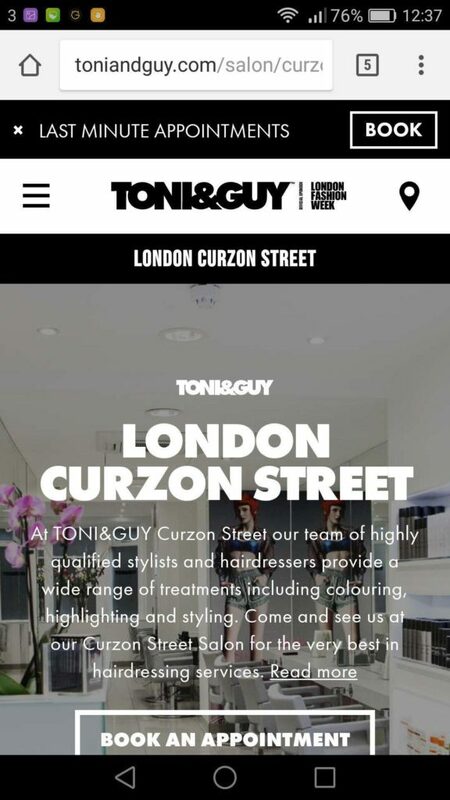 The Toni and Guy app is a great example of a cracking salon app. 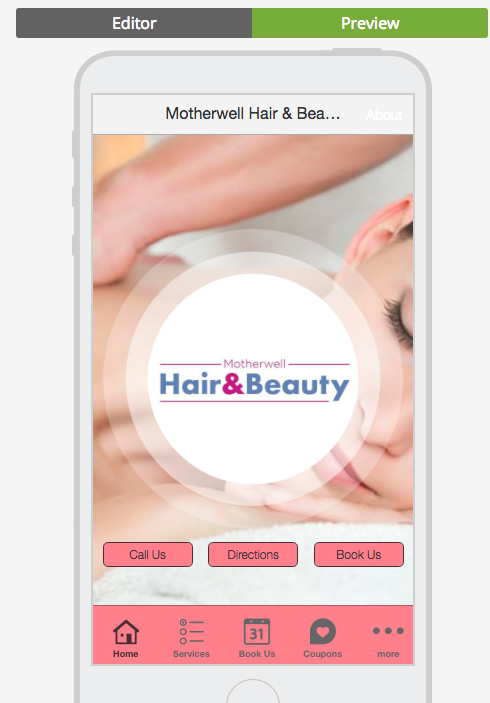 The app lets you find and bookmark local salons across the country, has an “alerts” section for latest news and offers, makes jumping on their social media accounts really straightforward, and lets you easily make bookings and send messages. 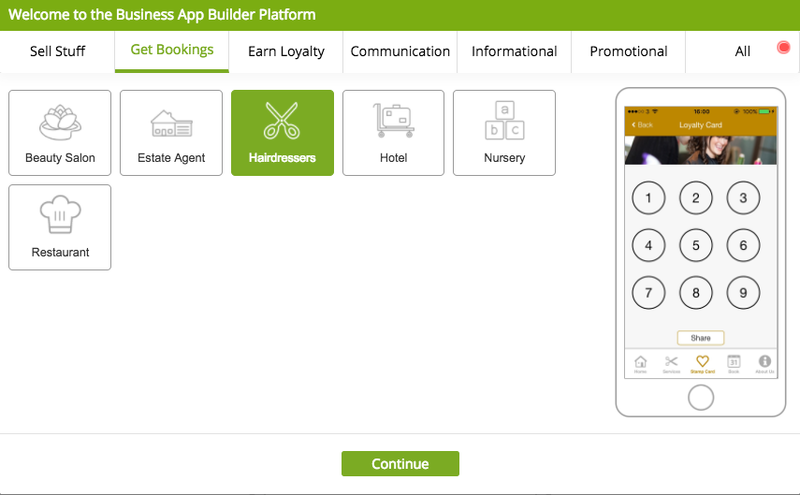 A great idea for your business is to encourage clients to download your app for future bookings. You can even offer them a 20% discount on their next cut if they download the app. The promise of future freebies and discounts, plus the simplicity of streamlined booking should keep them using your app for years to come. This guide should have given you plenty of practical advice to be getting on with. 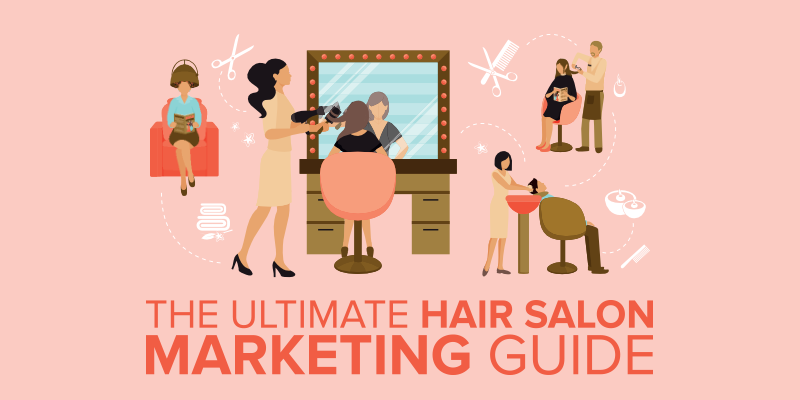 Check out our blog for the latest in-depth marketing guides and analysis; it’s an excellent resource for all those who want to get deep into the nitty-gritty and take their hair salon marketing to another level.